Venues for bookcrossing, the practice of anonymously leaving marked books to be picked up by someone else, are being set up across the city. The second official "Biblionoch" will take place between April 19 and 20, and for the English speakers among us, sections at specialized arts venues continue to expand. "Biblionoch" means "library night" and works in a way similar to Moscow's nocturnal museum sessions. The event aims to promote a thirst for reading in Russia. Although it was informally organized in 2011, this will only be the second time the event has been officially held. Last year, the doors of more than 30 Moscow libraries opened during the evening, but up to 20,750 organizations countrywide were also involved. This year "Biblionoch" will take over numerous venues in Moscow, among them the Turgenev and Nekrasov libraries, and the Winzavod Modern Art Centre. Six different projects will take place throughout "Biblionoch" in the capital. A special "Readers' Marathon" has been set up to determine which contemporary Russian authors have contributed the most popular reading material for city residents. On "Biblionoch" the most popular authors will meet with readers and participate in an online conference. Throughout the event, readers will be able to meet with writers and participate in workshops and competitions too. Growing recognition is also being given to the practice of book-crossing on the streets of Moscow. 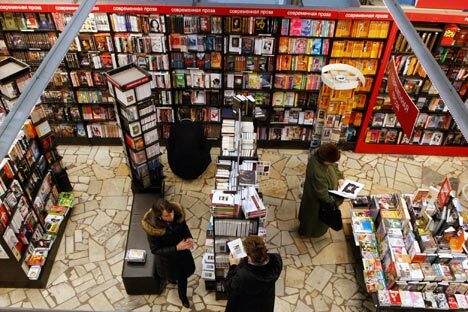 In March, the head of Moscow's culture department, Sergei Kapkov, said that come summer, a pedestrian zone in the centre of the Russian capital would be allocated for bookcrossing. Book-crossing in Moscow originated from the international website which launched promoting the practice about 12 years ago. It was brought to Russia more recently, between 2004 and 2007, and its ever-increasing popularity in cafes and shops has even inspired city authorities to endorse it. The practice does not necessarily need a special place; a book can be left anywhere. However, the idea is included in the plan for the new arrangement of pedestrian zones, according to Izvestia. To mark Writer's Day on March 3, the book-crossing venue Knigodom opened at the Moscow Theatre of Russian Drama. Similar shelves can also be found in Library 53, Anticafe Green Door, and the art school Otkrytie. A well-hidden second-hand shop on 6 Ulitsa Pokrovka also has a free shelf and a jaunty blue postbox for post-crossing. There is no reason why such venues shouldn't accommodate the transfer of English-language books. However, the city is also well-stocked with more consistent sources of this literature. Among the broader-scope English-language shops or shops just containing an English-language section are Bookrunner, Dom Innostranoi Knigi and Dom Knigi, but the more arty venues are also bursting. Gogol-Books (8 Ulitsa Kazakova), which opened in the Gogol arts centre in the last couple of months (not to be confused with the club of the same name near TsUM), is still in its early stages, with high hopes for expansion. Its owner Alexander Tishkov previously ran the creative space Shardam. The plywood shelves at Gogol-Books hold imported issues of Dazed, Gentlewoman, V and Pop magazine, which are meant to be a source of attraction for the young Russian hipsters. "We're buying some fashion magazines. Beyond the most common ones, there isn't much interest like there is in the U.S.A. or France," said Maria Gusarova, one of the shop supervisors. "However, we get people coming in from the theatre who are interested in the books and we are trying to stock more theatrical literature." Shop managers are also making an effort to stock more specialized art and philosophy books, including the Russian philosophical journal Logos, collections of art by Mark Ryden or coffee table studies on subjects such as the modern Japanese house, the "voguing" modern dance and New York's house ballroom scene. They also stock some self-published Russian titles and handmade jewellery. The Winzavod Modern Art Centre has considerable expertise in alternative book subjects, sorted into sections from Iconography to Bauhaus, and also stocking the Artforum international magazine and Canvas magazine, which explores contemporary Middle-Eastern art. Slightly less-polished, but much more substance-over-style is Mir Kino (6/8 Ulitsa Maroseika), which not only has a wide selection of independent, foreign and Russian films that its name promises, but also a great selection of English-language books on the same subject. It's possible to find English-language books on Russian filmmakers here, such as the "Mirror and Pomegranate," which collects works from the private collections of Andrei Tarkovsky and Sergei Paradzhanov. Mir Kino also stocks some slightly kitschier titles such as "Dogs in Vogue" and paper-doll dress up books featuring Debbie Harry, David Bowie and Rihanna. The atmospheric Universum (16/5 Ulitsa Malaya Nikitskaya) is also worth a nose around. So keep buying, borrowing and bequeathing — it doesn't seem to be the end of the printed word in Moscow just yet.